(US Air Force photo/Tech. Sgt. 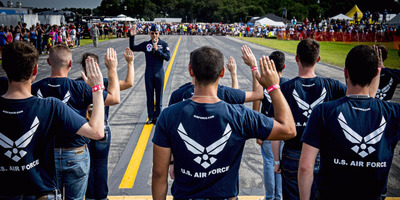 Manuel J. Martinez)Maj. Tyler Ellison, a Thunderbirds pilot, administers the oath of enlistment to enlist Florida’s newest airmen during the Sun ‘n Fun International Fly-in and Expo Air Show at Lakeland, Florida, April, 25, 2015. US military branch chiefs on Monday emphasised the importance of servicemembers to their forces’ operations. They also stressed they would be competing for the most qualified members of a small pool of applicants. 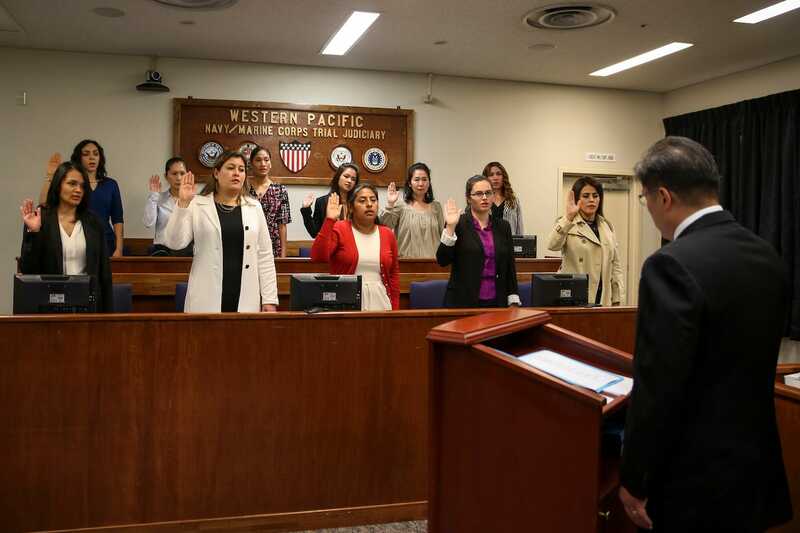 In recent months, changes in immigration policy have added more uncertainty to the lives of non-citizen servicemembers and their families, which may affect recruiting in the future. The Army, Navy, and Air Force are all facing increased difficulties attracting servicemembers, but shifting US immigration policies may make the military a less appealing option for some of the most sought-after recruits. “At the end of the day, people are what makes everything work, and we really have to focus on this. 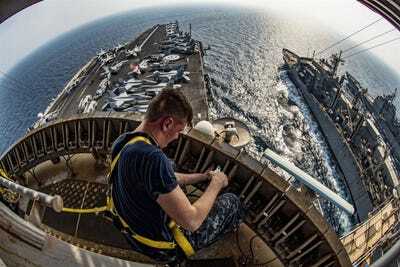 Going forward we’re all going to have a real war for talent,” Navy Secretary Richard V. Spencer said Monday at the Center for Strategic and International Studies, sitting alongside Army Secretary Mark Esper and Air Force Secretary Heather Wilson. “The three of us up here fish from the same pool, and we’re all going to be looking for more people to do more things in a more intelligent manner,” Spencer said. Senior military officials have emphasised increased recruiting and growing the size of their forces as key components of improving readiness. Wilson said in September that the Air Force was “too small for what’s being asked of us.” Army Chief of Staff Gen. Mark Milley said in October that he had believed for “quite some time” that the Army needed to add more soldiers. “We need to grow in order to meet the demands that the nation expects at the readiness levels it expects,” Milley said. Recruiting has been a stumbling block for the armed services. Last year, the Army – which is seeking 80,000 troops in 2018, 11,000 more than were sought in 2017 – started accepting less-qualified troops, offering heftier bonuses, and granting more waivers for previously disqualifying things, like marijuana use and, in some cases, histories of mental illness. The Army was adamant that it was not lowering its standards – rather it was changing the level of authority at which decisions about waivers for some standards were being made. Recruiting efforts have also been complicated by a robust US economy. While the Pentagon has met its recruiting targets in recent years, low unemployment rates, common during the past few years, are seen as a hindrance. Navy photo by Petty Officer 3rd Class Nathan T. BeardNavy Petty Officer 3rd Class Brian Evans repairs an antenna system in the Persian Gulf, September 2, 2016. To drum up interest, the Army has added hundreds of recruiters who are increasing efforts to win over high-school principals and teachers – referred to as “influencers,” according to Bloomberg. Further complicating matters is the shrinking pool of qualified recruits. Almost 75% of Americans between the ages of 17 and 24 are ineligible for the military due to obesity or other health problems, criminal histories, or a lack of education, according to government data seen by Politico. Texas Rep. Mac Thornberry, chairman of the House Armed Services Committee, has expressed openness to fitness waivers for otherwise-qualified recruits. However, recent reports indicate that US immigration policy is now making life harder for some people already in the military to stay in uniform – and, for some of their dependents, in the country. US Citizenship and Immigration Services has shuttered all of its offices at US Army basic training installations – a move that further complicates matters for recruits who were promised a fast-track to citizenship in exchange for joining, according to BuzzFeed. US Marine Corps/Pfc. 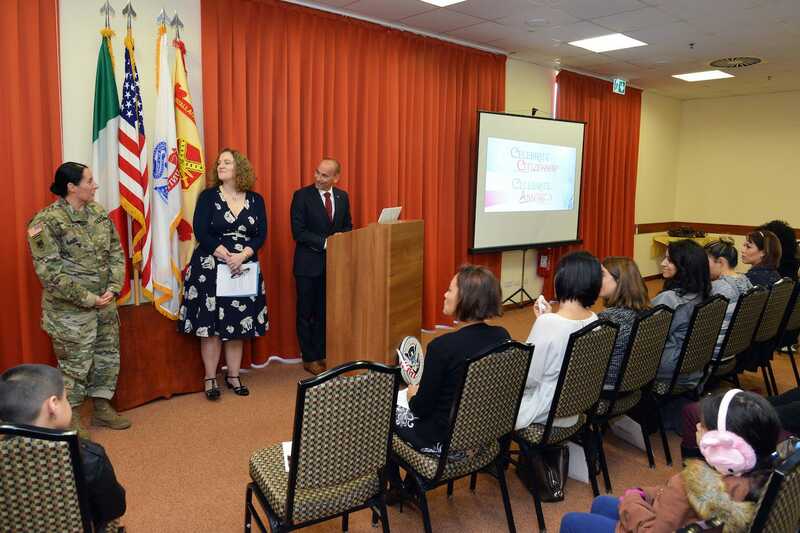 Nicole RoggeCandidates raise their right hands and repeat the Oath of Allegiance during a naturalization ceremony at Camp Foster, Okinawa, Japan, January 31, 2018. A USCIS document dated January 30 cited “changes in Department of Defence requirements for certifying honorable service for US service members applying for naturalization” as the reason for the closures, which end naturalization services for servicemembers applying immediately after completing basic training. That expedited process was a key plank of the Military Accessions Vital to National Interest program, which has naturalized more than 10,000 servicemembers since 2009. USCIS’s changes now require troops on active duty to serve for at least 180 consecutive days and complete more background and security checks before receiving citizenship, according to BuzzFeed. The additional requirements push many immigrant recruits past the time limit on the visas that let them enter the US. The additional scrutiny that threatens their immigration status began during the Obama administration, but at that time expedited naturalization was still available. “The fact that I potentially would be an American soldier but still not be an American citizen after finishing training doesn’t feel right at all, and the thought of that is very heartbreaking,” Harminder Saini, a 24-year-old Army recruit from India, told BuzzFeed. Saini was recruited for his ability to speak Punjabi fluently, as language skills are highly sought by the US military. The Army recently took steps to expand its ranks of Arabic speakers by reclassifying them and altering promotions and pay based on dialect – with Iraqi, Levantine, and Egyptian Arabic speakers the most desired. (US Army/Paolo Bovo)US Army Maj Chiara F. Turcato, Vicenza military-intelligence detachment commander, left, and immigration officials congratulate new US citizens during a naturalization ceremony in, Vicenza, Italy, November 17, 2017. Uncertainty about their immigration status is not limited to those in uniform. Numerous military-family members told Military Times in recent weeks that they faced deportation and feared their families would be broken up despite their military service. “We’ve been waiting for [US Immigration and Customs Enforcement] to come pick me up,” the undocumented husband of a female US soldier said from Texas, where he cares for the family while his spouse is deployed. Their responses were prompted by the story of retired Army Sgt. 1st Class Bob Crawford, a veteran of the Army’s 7th Special Forces Group, who had been fighting for years to get legal status for his wife, a native of Honduras who crossed the border in 1999, fleeing Hurricane Mitch. At the CSIS event on Monday, each of the service chiefs emphasised the importance of servicemembers to the military, describing them as a comparative advantage that sets the US apart from adversaries.